Every Canadian (and some Americans) needs their fix of Tim Hortons. And usually, around every corner is a new store. But what happens if there isn't? You could be wandering the streets for possibly hours! 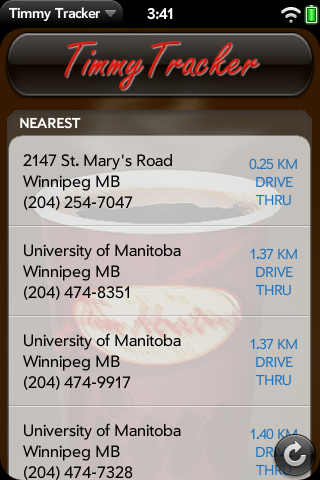 Fear not brave Timmy addict, here lies the app you've been waiting for: a Tim Hortons tracker. It will grab your GPS location and list the nearest restaurant locations. Full address & phone details are given, with indicators showing how far away the restaurant is and if it has a drive thru. What's more, tapping a listing will direct you to a Google Maps entry. For fear not, and be reassured by the countless locations within range. Note: This is an unofficial app and is in no way developed by or endorsed by Tim Hortons inc.